Brand new Chevy 350 4-bolt main, two-piece rear seal Pre 1986 style bare block. 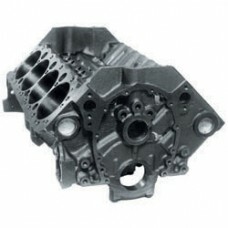 This Chevrolet block is less money than the cost of buying and preparing a used one. Why bother with all the hassle of a used block at +0.030”, 0.040” or larger bore when this new block is ready to start assembling at standard 4.00” bore (and still with lots of life left). This Chevy engine block is ideal for anyone re-building a tired engine or wishing to build a high performance engine from scratch. We have built many 450 HP engines using this block without failure.